In the Follow-Up Part 1, I explored some of the functions in the quantstrat package that allowed us to drill down trade by trade to explain the difference in performance of the two strategies. By doing this, I found that my choice of a volatility measure may not have been the best choice. 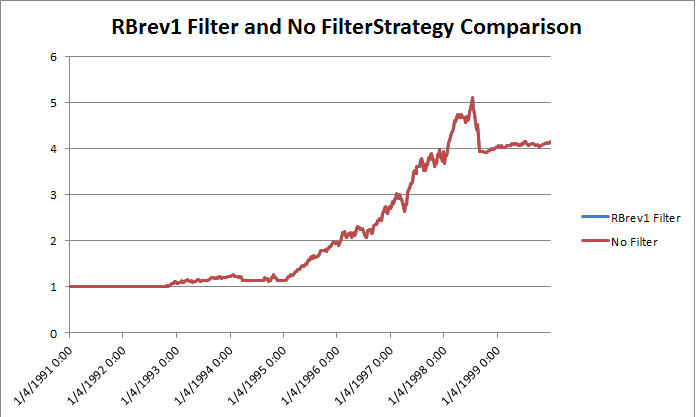 Although the volatility filter kept me out of trades during periods of higher volatility, it also had a negative impact on position sizing and overall return. Buy Rule: Go long if close is greater than the 52 period SMA and the 52 period standard deviation of close prices is less than its median over the last N periods. I will test the strategy on the adjusted close of the S&P500 using weekly prices from 1/1/1990 to 1/1/2000 just as in the previous post. And the winner is… both! There is no difference in performance on this single instrument in this specific window of time I used for the test. Always do your own testing to decide whether or not a filter of any kind will add value to your system. This single instrument test in the series of posts showed that choosing the “wrong” volatility filter can hinder performance and another choice of volatility filter doesn’t have much impact, if any, at all. How do you think the volatility filter will affect a multiple instrument test?